How does Tango do it? I wanted to post this, but I did ask the creator if this was OK, in an e mail this morning. Not had a reply yet, so I was wanting to hang on, to check OK.
Don't believe he asks permission from anyone. Also, stuff gets lost in the sheer amount of chaff he posts. I do not consider a period of less than 24 hours a delay in reply……..not by the standards of my professional colleagues. This British range is superb. Different and imaginative posing and of human proportions. Yes indeed 'deadhead', they look like superb sculpts with lots of character. I pledged for three battalions. I wish Three Armies much success! Agreed, these look great. I've placed an order. Hope there are many more standing and marching figures to come. Very nice figures, lot character in their faces. 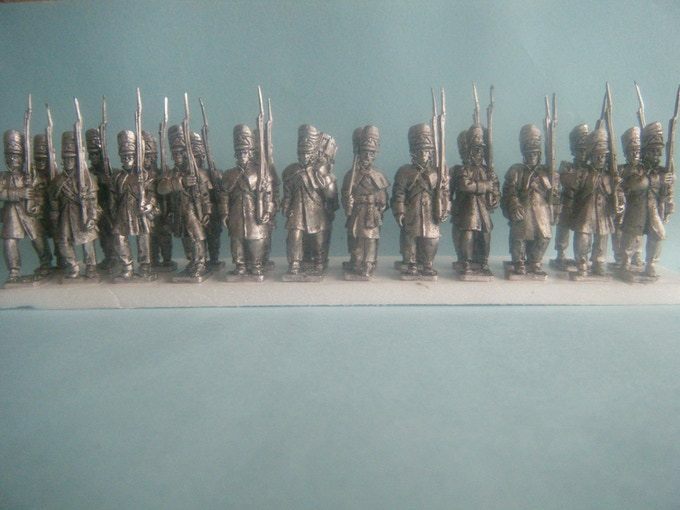 I would also stress that the figures in overcoats and "shako" covers would be great for that odd conflict in the North American Continent 1812-1815…….must have seemed like a good idea at the time I guess. The real shame is that the overcoats were all returned to stores well before June 1815, to lighten the soldiers' burden. After all, it is hardly likely to rain in June in Belgium……….unless it does of course. I am glad to see the cap here, with all the ornaments. It is like cavalry with pennants and eagles. We all know it is wrong, but it just looks so good……….and it is far easier to cover the shako with Greenstuff than do the reverse! Oh these "foul weather" figures are so unusual, I would happily use them in 1815. If we can hand out eagles to every unit, whether Hussars or Marines and pennants for every British cavalry regt, let's stretch things a bit and give them what they really could have done with! Eh? Could you elaborate, Deadhead? Purely that on a battlefield the cap was covered, as for the foul weather chaps in overcoats. But we want to see them in their finery and it is easier to add a cover, if wanted, than the reverse. I was comparing that to so many things we show that are "wrong", but just look great. French Hussars carrying eagles into battle, Household Life Guards with pennants, trumpeters of every nation riding greys………..
Can we sure about that? I would have thought the whole point of having different coloured plumes for light company etc, would have been so that they could easily be identified in the smoke and chaos of battle. Forgive my ignorance but how do I buy some of the standing around figs? They're just what I've been hoping for! The hussar pelisse is a very good example indeed. Just how we all want to show them……..however "wrong". These will sell, they deserve to and the "exposed" cap was exactly the right decision. Good news, thanks. I'll look forward to getting some. On the topic of "wrong" mainstream, we could probably make a long list. In the British infantry about half of the 100 regiments had square plates on their crossbelts, and the other half were oval. 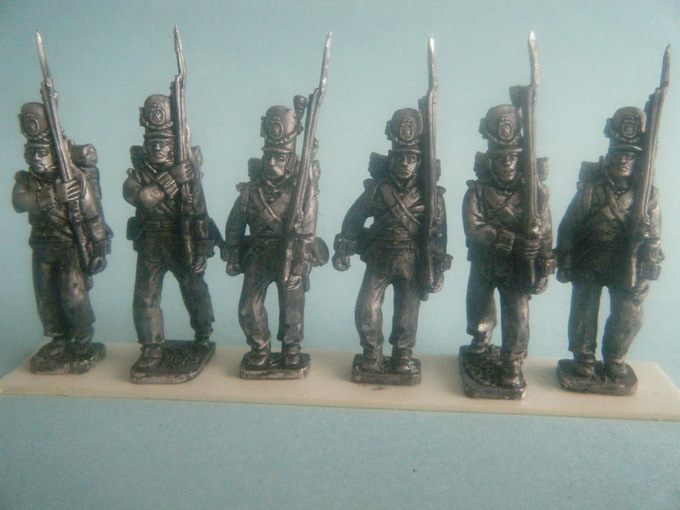 Perry plastic 28mm are depicted in the square plate, and Victrix in the oval. 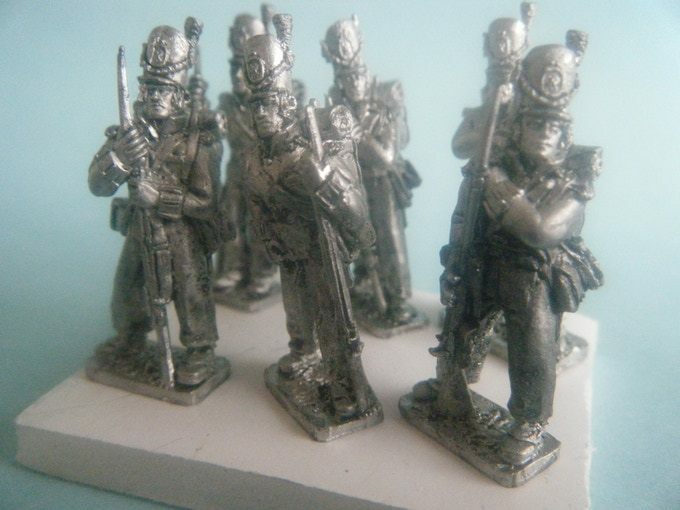 I wonder how many hundreds of carefully painted 28mm regiments are therefore "wrong"? I try not to lose too much sleep over it. The crossbelt plate is indeed a good one. Add to charging hussars with a slung pelisse, eagles and/or pennants. The worst is the rumour that all British Infantry were wearing the "Belgic Shako" by 1815. Forget everything you thought you knew about the stovepipe and the Rifles, The Light Infantry and the 28th of Foot……? That I would lose sleep over…..actually no, the thought is….well, unthinkable. 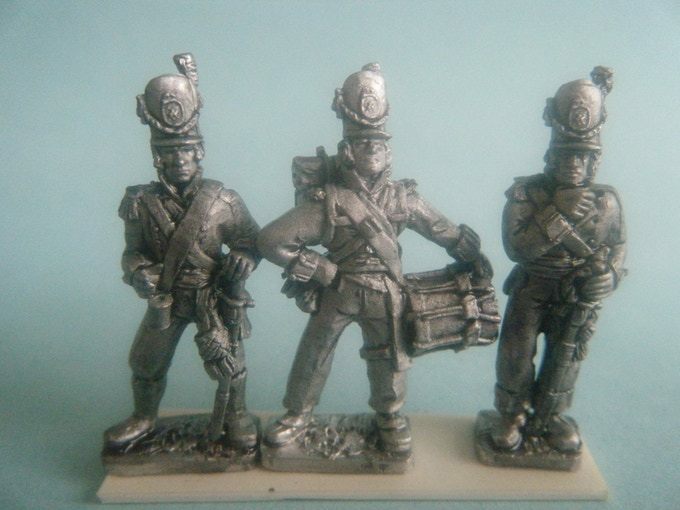 I am sure everyone has seen the earlier releases in this range, but let me at least mention the French similarly posed, at rest or marching. Notice the quality of the painting too! Got mine pledged now…..looks like you will be busy!